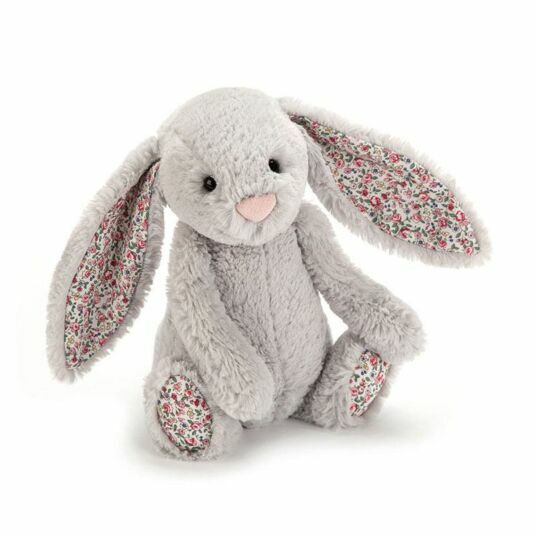 This wonderful Small Blossom Silver Bunny brought to you by Jellycat; is a fantastic cuddly bunny. She is a great companion, ready to jump, run and play. Great for warm snuggles and lots of fun! She has really soft delicate grey fur, beautiful black beady eyes, a light pink nose, big floppy ears, large clumsy feet and drooping arms. Underneath those big floppy ears and on the soles of her feet, a separate fabric has been used; it’s a beautiful floral patterned material with vines and colourful flowers flowing all over, it creates a great contrast with the grey fur. This beautiful piece is an amazing gift, great for Christmas, birthdays and valentines. Don’t hesitate with this great gift; this bunny will happily come jumping into your life.